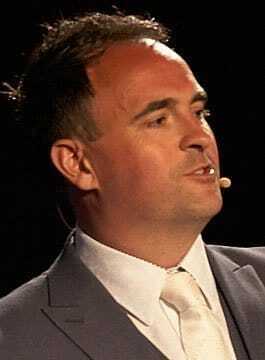 Geoff Ramm is the creator and author of ‘Celebrity Service’ and ‘OMG Marketing’. A multi-award winning customer service speaker and marketing speaker, Geoff has challenged and inspired audiences across five continents. With a genuine passion for his subject, he’s humorous with original content and will challenge you to greater results. Geoff delivers ‘real life’ observational content, passionately delivered, enabling you to look deeper and think harder how to stand out from the competition. Delegates will not only discover out-of-this-world ideas, they will come up with them and be excited to implement them. Companies across six continents have outperformed their competitors by using Geoff’s unique insights on customer service and marketing. With hundreds of observational ideas, images, videos and stories, each presentation is personalised to ensure lasting impact and high takeaway value. You won’t see any graphs, charts or statistics, just an abundance of ‘real life’ ideas from around the world to help transform your current ideas into greater results. Working with high profile clients across all industries, Geoff Ramm has worked with entrepreneurs to launch start-up enterprises without limited budgets and has created marketing ideas which have become legendary. You probably think you deliver great service, but then a celebrity walked in… and everything changed! Discover the brilliantly unique philosophy that is ‘Celebrity Service’. See the people and brands from all over the world who will inspire you to create incredible customer service. WARNING: Your customers will love you. Your competition will not. This presentation will not only inspire your audience but will generate unlimited ideas to help them stand out. From the worlds’ most amazing business cards, promotional materials that defy the national response rates, to the greatest email of all time; see how brands of all sectors and sizes stand out from the crowd with limited budgets. Discover the marketing campaigns that generate amazing publicity and learn how they excite & engage audiences throughout the world with their social media and marketing strategies. OMG is also available as a masterclass to generate unrivalled creativity which you can take forward into every marketing campaign. Both ‘Celebrity Service’ and ‘OMG Marketing’ lead to one thing… Sales! From upselling Arnold Schwarzenegger style at Planet Hollywood to the airports of Tehran at 3am, through to a homeless man making sale after sale selling his wares on the street. This presentation will reveal the greatest Observational Selling techniques that will transform your team’s thinking and selling. Prepare to be entertained, energised and enlightened on a journey of customer service and marketing ideas that will enthrall, enthuse and inspire your delegates! To check availability and fee, or to book motivational speaker Geoff Ramm please contact us to speak with an agent for Geoff.